There's no calories if you make it all from scratch, right? Once I started with making marshmallows I had to try my own variation using ingredients in my own home. I used some home made pear butter I put up in the fall and the results were delish. I hope you like it. 1 teaspoon Vanilla Bean Powder. Grease an 8×8-inch pan with an olive oil using a pastry brush or spray with cooking spray. BLOOM: Combine the bloom ingredients and whisk together. Set aside for atleast 5 minutes then microwave the bloom for 30 secs to melt it. GET THE COLD MIX MOVING: Place the remaining 1/4 cup corn syrup in the bowl of an electric mixer fitted with the whip attachment. Start the mixer on low speed, add the bloom and syrup into the cold corn syrup. Keep the mixer running on low speed. HOT SYRUP: Mix the white sugar, 1/4 cup corn syrup, pear butter, nectar and salt in a large sauce pan over high heat. Boil until it reaches 240 F measuring the temperature with a candy thermometer. Slowly and carefully pour the Hot syrup into the cold mix. Beat on medium for 5 minutes, then increase to medium high and beat for 5-7 minutes. Add vanilla extract at the last minute. Pour the marshmallow into the prepared pan, using a lightly oiled off-set spatula smooth the mix into the corners. Sift generous amount of coating over the marshmallows (use up to 2/3ds of it). Allow to set for 8 hours. 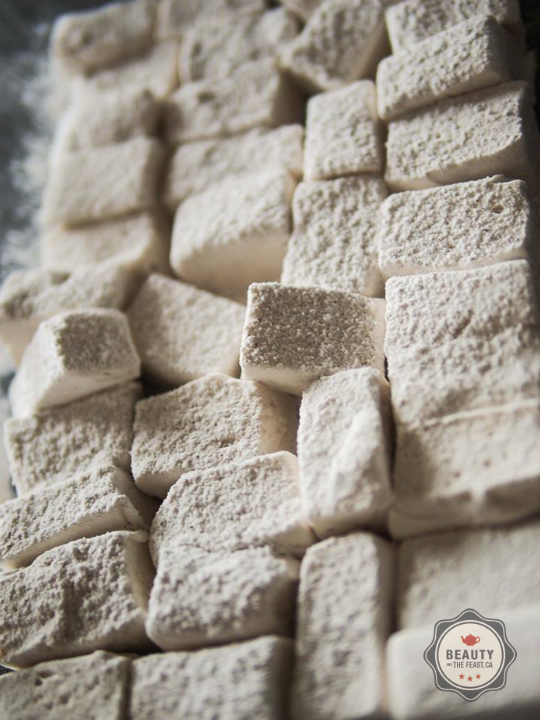 PREP MALLOW: Sift together mallowing ingredients corn starch, icing sugar, vanilla bean powder. Set aside, and keep the sifter handy. Use a knife to loosen the marshmallow from the edges of the pan and invert it onto a vanilla-confectioners’ sugar mixture-dusted work surface. Cut the marshmallow with a cookie cutter or into squares with a pizza cutter or sharp bread knife. Dip the sticky edges of the marshmallows more coating and dab more all over the marshmallows, pat off the excess. Store in an airtight container for up to 3 weeks.